It wasn’t all that long ago – within most of our readership’s lifetimes, in fact – that the oil and gas industry was using New Orleans as one of its main industry centers. That made a lot of sense, obviously, with all the offshore drilling in the Gulf of Mexico and all the oil refining being done along the lower Mississippi from Baton Rouge downriver. But from the 1970’s on, as left-wing leadership beginning with the clownish Moon Landrieu began to take hold, the oil and gas industry increasingly saw the Crescent City as a bad place to do business. And one by one, the majors and prominent independents pulled up stakes and abandoned downtown New Orleans as a place to have main or regional headquarters. And now, what used to be a downtown New Orleans dotted with oil and gas company headquarters – and those of the industries servicing offshore drilling and other related activities – is increasingly a downtown New Orleans with office buildings going condo, as rich out-of-towners and their interior designers outfit former energy-sector offices to serve as weekend pleasure nests. New Orleans’ economy is increasingly based on little other than hospitality and tourism – with the low-wage jobs of that sector replacing the high-wage jobs paid by the oil patch as they’ve abandoned New Orleans for Texas. What’s left of oil and gas – and it isn’t much – in New Orleans is almost surely gone after what happened Friday. New Orleans Mayor LaToya Cantrell filed a lawsuit Friday (March 29) against Entergy New Orleans, Chevron U.S.A. Inc, ExxonMobil Pipeline Company and eight other oil and gas companies, demanding they repair damage caused by exploration, production and pipeline construction activities to wetlands along the city’s eastern edges. The lawsuit, filed at 5 p.m. in Civil District Court, is similar to dozens of other suits filed against oil and gas firms by six Louisiana parishes. Those suits are pending before federal judges in New Orleans and Lafayette. 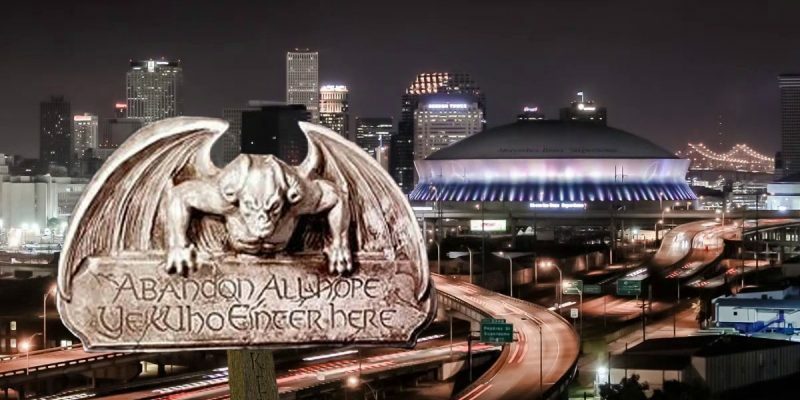 “New Orleans has been harmed. The people of our city have been harmed, and our way of life is threatened by the damage done to our coastal wetlands,” Cantrell said. “The land that’s been lost was a protective barrier defending us from hurricanes and floods. If current trends hold, New Orleans will be a literal coastal city within the next fifty years – with no protective land barriers. “We are filing this lawsuit to ensure that the residents of Orleans Parish are safe, our economy is protected, and to help restore our coast” said City Attorney Sunni LeBeouf. Did you notice that Entergy was named a defendant in that suit? Entergy is, by the way, the only Fortune 500 company left with its headquarters in New Orleans. It isn’t even an oil and gas company per se – it’s a utility company. Cantrell and her collection of idiots sued Entergy anyway – after levying a ridiculous $5 million fine on the company for hiring paid actors to demonstrate support for Entergy in front of the New Orleans City Council to counter the paid demonstrators who commonly appeal to oppose Entergy’s plans, in that case to build a new power plant in New Orleans East that would have created meaningful jobs in the city. And now this lawsuit? Can we start the countdown before Entergy throws up its hands and pulls its headquarters out of New Orleans? They’d be crazy to stay. “It is unfortunate that local leaders in New Orleans have partnered with plaintiffs’ lawyers who are meritlessly targeting the energy sector,” Landry said, speaking on behalf of Chevron and ExxonMobil Pipeline Company. The Louisiana Oil and Gas Association (LOGA) and the Louisiana Mid-Continent Oil and Gas Association (LMOGA) issued the following statements in response to the City of New Orleans filling a Coastal Management Zone lawsuit against a multitude of oil and gas companies. “Nothing good comes from suing an industry that means so much to New Orleans. Right now, there are more than 1,600 New Orleanians and a couple hundred New Orleans-based businesses working in the energy industry here. These businesses employ citizens from every corner of the city. The message being sent to thousands of New Orleanians who have made their lives and raised their families in the City of New Orleans is that their work, their years of paying taxes, rebuilding their homes and neighborhoods, and their value to the community means nothing. The city would rather sue them. Lawsuits do not build relationships. They end them. If this issue was about truly working together on coastal management and building, then the city would recognize that New Orleans’ energy industry is already a dedicated partner in addressing Louisiana’s coast. The industry is also one of the largest partners in dozens of the city’s most recognized community efforts, including ground-breaking partnerships like NORDC, GNO Inc., and ongoing programs with local schools, non-profit and environmental organizations here. Parse those statements only a little and there’s a very clear statement coming from the oil industry: we’re leaving, because we’re not going to be treated like this and put up with it. Chevron already pulled their headquarters facility out of New Orleans and moved it to the Northshore. But go to all those tourist-trap events in New Orleans – Jazz Fest, Essence Fest and the like – and you will see Chevron’s logo everywhere as a corporate sponsor. How much longer do you think they’ll bother to do that when the city’s mayor waddles into court trying to blame Chevron for marshland erosion any idiot can tell you comes from the Mississippi River being leveed to its mouth? Stupid is as stupid does, and LaToya Cantrell is as stupid a politician as New Orleans has ever had running it. This was a catastrophically stupid decision that will almost surely end the oil and gas industry in the Big Easy, and might even run off the only Fortune 500 company the city had left.